A political poll in California is under the spotlight after a relatively unknown candidate surged in recent weeks. Sam Brock reports. A relatively unknown U.S. Senate candidate in California who was booted from the state's Republican Party Convention for a campaign promise to "remove Jewish leaders" from power is getting new attention since seen surging in one political poll. 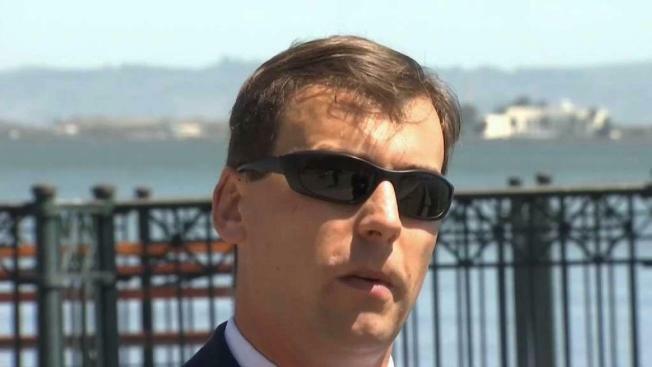 Patrick Little from Albany had little political profile until he popped up second on a late-April Survey-USA poll, garnering 18 percent behind incumbent Sen. Dianne Feinstein. "My whole campaign is predicated on removing the Jewish supremacists from control of our country," Little said in an interview with NBC Bay Area. The Jewish Community Relations Council has denounced Little's platform in the strongest possible words, calling it "anti-Semitic vitriol." Little, who has praised Adolf Hitler and calls himself a "counter-Semite," has been endorsed by former KKK leader David Duke and claims to draw inspiration from President Donald Trump. "He showed me that people were willing to respond to dog whistles about whites having group interests, so I decided to state these things explicitly," Little said. Little leapfrogged into viral status following his appearance on an inflammatory video and dismissal from the Republican convention. "That type of position that he stands for has no support among our delegates, and that's evidenced by the fact that we promptly ejected him from the premises," said Harmeet Dhillon, California spokeswoman for the RNC. "You know, we don't want his money. We don't want his supporters. We don't want his ideology in our party in any way." Dhillon said Survey-USA polling is known to be "flawed" among political professionals. She points to a Berkeley IGS poll released almost the same day that does not even list Little. Yet Nate Silver and the wonky FiveThirtyEight blog rate Survey-USA an "A" for reliability. Sen. Feinstein's camp also cast doubt on the poll, wondering how Little ended up as one of "seven" candidates presented to respondents out of 32 Senate hopefuls.